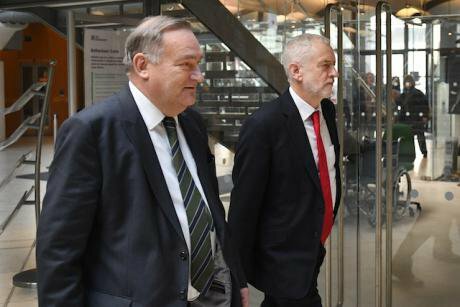 Labour leader Jeremy Corbyn and the party's chief whip Nick Brown walk through Portcullis House in Westminster, London, to Prime Minister Theresa May's office. January 30, 2019. Stefan Rousseau/Press Association. All rights reserved. Theresa May seems to be quietly benefiting from a bizarre, instinctual deference from wearied senior journalists covering Brexit, the political equivalent of an endless wait at baggage reclaim. The source of this deference possibly arises from a repetitious familiarity with all six lines of the script, or the vicarious predictability of her statements both to parliament and to the media, in all their patrician, pedestrian emptiness. Whatever the explanation, this cap-doffing is becoming increasingly difficult to explain to inquirers on the continent, who rightly point to the untenability of May’s position and are exasperated at the gall of someone who denies that she faces undeniable checkmate within three moves. Jeremy Corbyn has astutely manoeuvred Labour into a position where he can illuminate an alternative outcome, but is both constrained by this deference and overshadowed by others more convincingly articulating unworkable silver bullets such as a second referendum. But an opportunity presents itself right now for Corbyn to set out a radical but realistic agenda to remain and reform the European Union. Offering socialist policies as solutions to Europe’s growing problems, it could unite a pragmatic coalition of Leave and Remain voices and oust a zombie Conservative administration. The outcome of last Tuesday’s parliamentary votes will be quickly forgotten in the coming weeks, not least because they are likely to be rehearsed soon in some scantily disguised variation, but primarily because they only negligibly alter the choices the government faces. One positive outcome, however, is that the chorus for a second referendum was confronted with some cold facts from Brussels on Wednesday. A second referendum would require an Act of Parliament, which would take months, assuming there is a government that can successfully deliver it. There must be around a dozen competing combinations of questions, responses and voting methods in contention. The small issue of actually having a campaign seems to have eluded scrutiny – are the most ardent Remainers actually confident the odds would be in their favour? The first referendum would be remembered as a paragon of transparent, evidence-based debate and considered, critical analysis beside the reductive, shouty binary of the second. Regardless of how many questions or ballot papers, the entire campaign would be a straightforward, grotesque brawl with immigration as the one and only item of debate, conducted with all the patience and finesse of a Westminster far-right protestor aggressively “just having a chat” with passing journalists and MPs. The thought of another referendum is a frightening prospect for some of the UK’s most vulnerable people – refugees and migrant workers and their families – yet from the moral uplands of Westminster it is thoughtlessly promoted as the only way out of the mess. What would happen if Leave won, again? The presumptions around extending Article 50 also seem to go unchecked. It is hard to envisage any circumstances in which the EU would permit an extension to allow for the full second referendum process. The scope for extension is so short as to be pointless – a few mere weeks before the European Parliament elections present legal obligations in the event of continued UK membership. And if Brussels managed to fudge some kind of extension, they will surely be keen to avoid offering flexible and convenient Article 50 packages to Viktor Orbán and the Italian Five Star Movement. To what end? Europe is fed up to the back teeth repeating that the (UK-manufactured) backstop and the rest of the Withdrawal Agreement will not be reopened. While UK commentators and parliamentarians opine on the inevitability of extending Article 50, it is not hard to see why there is opposition to it in the EU27. It is, in the end, a “hair of the dog” strategy designed only to delay pain. The second referendum argument might carry weight among Scottish and Northern Irish remainers, but it is now time to set it aside given its irrelevance to the task at hand, at a time when the indisputable priority across the broad liberal and left spectrum in the UK is to remove the no-deal billionaires’ utopia as an option. The disappointment of Tuesday’s amendment votes in Parliament is outweighed by the opportunity for Corbyn to emerge from meetings with the Prime Minister eliciting the unavoidable conclusion that she is content to redraw red lines while the UK sails into the social emergency of a no-deal Brexit. If parliament is still willing to indulge this histrionic spectacle, then the waves of popular support that saw him (re-)elected to the leadership of the Labour Party need to resonate in the country once more to jolt parliament into the real world, and to oust a no-deal government. General Strikes are already making a comeback in 2019, from Kerala to Paris. Corbyn, Momentum and the trade unions should get ahead of the curve and call one in mid-February if no-deal is not categorically taken off the table. Such situations might make for more winnable votes of no-confidence in Her Majesty’s Government, and produce the General Election that the Labour Party have been calling for. Were that election to elevate Corbyn to No. 10, the stark, inherited choice would be to revoke Article 50 or crash out without a deal – an impatient EU is not going to substantially reopen negotiations on May’s deal at this stage. Think of the political capital PM Corbyn would accrue from revoking Article 50 in this Hobson’s Choice scenario. The European Union is a changed place since David Cameron embarked on his failed “reform” initiative preceding the referendum. The refugee crisis of 2015 has been compounded by a crisis of neoliberalism in 2018, instigated by resistance to Emmanuel Macron’s deepening of privatisation, austerity and labour market liberalisation. In France, at least, the gilets jaunes are winning. The EU’s top brass had thought until recently that austerity measures had weathered the 2008 financial crisis, that the rise of the far right is only a temporary wobble in an otherwise sound political economy. They have still not been disabused of this notion and meanwhile the far-right profit from the low-wage, debt economy proliferating in post-industrial urban centres across Europe for two decades. Attempts to conflate the various strands of Europe’s crises into ‘populism’ demonstrate this denial of reality quite clearly. The result is precisely what conservative and liberal national governments in France, Germany and elsewhere are now contending with. Neoliberalism has reached its limit and is undermining the foundations of the post-Cold War political settlement. The electoral and street-politics gains of the far-right have shaken one pillar of the Union – free movement. Now the whole building is shaking. Far from being aloof, Corbyn has identified the priority for the UK correctly – to understand why people voted Leave and address that through investment, instead of accepting the immigration rhetoric peddled by the far-right. This is not achieved by flashy tinkering with policy or a rehearsal of the losing arguments of the first Remain campaign – it needs transformative economic heavy lifting in everything from welfare to the NHS, energy to public transport. People voted Leave in 2016 as much out of having nothing to lose as for half-baked prescriptions for restoring sovereignty through restricting free movement. These are lessons with relevance to several of the EU27. The risks? Revoking Article 50 would be seen as illegitimate and embolden and anger the far-right. Well, the same goes for every other option, including a second referendum. The holding of the first referendum was the real boon to the far-right, and any outcome of the Article 50 process is one in which they gain ground through waves of reaction on the street, goaded by the Brexiteer elite. The conversation needs to quickly move to interrupting their stride—and in this regard Labour’s putative programme of social investment is robust, fresh and timely. What should his gambit be? Here’s one idea: a new EU Treaty for a Social Europe to replace Lisbon, not only democratising the EU’s institutions, but rolling back austerity dressed as “fiscal discipline” and the straitjacket of privatisation and outsourcing in public procurement (removing the perceived barriers to renationalisation of industries and services). And rolling out a realignment of the State’s role in the economy towards social security and environmental protection, with more power to harness industry to innovate towards social ends and to address serious threats such as climate change. If Corbyn was rebuffed or obstructed by Brussels in his efforts to negotiate a new Treaty with other left and social-democratic EU Council allies, Article 50 would be the threat, this time not because of some Etonian playground fisticuffs spilling into national politics – rather for jumping ship before the EU disintegrates under the weight of its own inertia in failing to reform its way out of its growing problems. European neoliberal hegemony is entering a major crisis in 2019, and the resulting opportunities for major reform need to be seized on. Corbyn could lead that charge and deliver to the UK electorate what Brexit simply cannot.